By looking at the following photos, you may find it hard to believe that such a fairy tale-like forest even exists. The tall, thin trees, skinny winding trail, and lush blue flowers that extend as far as your eyes can see give the area a whimsical feel. In some shots, when the foliage is covered in a hazy fog, the forest even seems somewhat haunting. Yet this spectacular place isn’t straight out of the pages of a story-book (even if it may look like it). This mystical forest is entirely real. Located in Belgium and arguably one of the country’s best kept secrets is the forest, Hallerbos, also known as the Blue Forest or Halle Forest in Dutch. The wooded area covers 1360 acres of the European country, mainly in the municipality of Halle in Flemish Brabant, but a small portion of the forest is also found in Walloon Brabant. Before it was its own forest, Hallerbos was part of the Sonian Forrest, which stretches over southern Brussels and boasts the title of Europe’s largest beech forest. 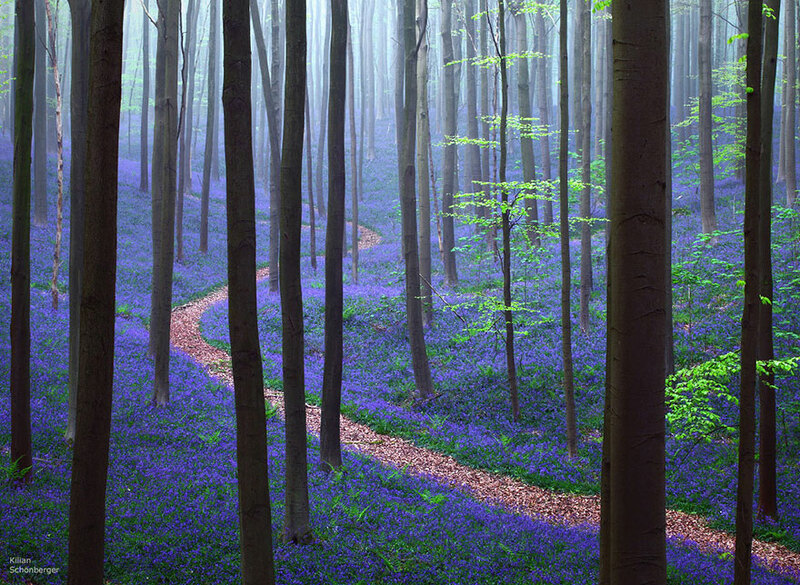 One of the most spectacular features of Hallerbos is its dense and vibrant carpet of bluebell flowers. The flowers thrive and bloom in spring and early summer, erupting into vivid blue and violet blooms that showcase the coloring of their petals for which they are named. The annual phenomenon transforms the forest for a few weeks, painting the floor a beautiful sea of blue. It’s a completely otherworldly experience to walk the winding path of the forest during this time, strolling beneath the trees and through the flowers as the sun streams through the canopy of leaves, shining onto the flowers to turn their pale blue petals a vibrant shade. The abundance of bluebells in the area suggests that the forest is ancient, taking many years for the flowers to grow and flourish as they do now. However, while the bluebells have been there for centuries, the trees haven’t. The original forest was destroyed during the First World War by occupying forces. Some of the ancient trees survived the devastation and can still be seen today, but most of the trees were planted between 1930 and 1950. While the bluebells may be the forest’s most obvious attraction, there are many other beautiful wild flowers scattered throughout the area as well. You can find tiny wood sorrel flowers, with their dainty petals and clover white leaves, and white star shaped ramsons or wild garlic that you’re likely to smell before you see. There are also common garden varieties that you may recognize, like Solomon’s seal and lily of the valley. The forest is additionally home to a multitude of wildlife. While walking through the flowers, you can hear the songs of birds resounding throughout the forest, the blackcap, warblers, wrens, and nuthatches the loudest. There are also red squirrels that quickly scurry up the trees, buzzards roosting in the high branches, and tadpoles and frogs swimming in the ponds. Hallerbos is not very far from Brussels, a major city and one of Belgium’s most popular attractions, so the forest is a worthy stop if in the area. Of course, the forest alone attracts hoards of visitors and photographers each spring, everyone who knows about the spot wanting to take a peek at the gorgeous scenery and spectacular blue blooms. But really, can you blame them.